Our Federal Deficit is in the headlines again. It’s a bi-i-i-g deal! (That’s why I’m capitalizing the F and the D). There’s talk everywhere of the fiscal cliff and debt ceilings and who should pay and what to cut … All the talk is, of course, dishonest and does not give any inkling to the average American about what the real picture is. The press simply jumps on the wagon of the politically self-serving parameters in this debate, reports “both sides” and basks in the improved ratings for the media garbage they generate. It is too lazy to learn the real perspective on our federal financial situation. So I am laying out a perspective here that, maybe, gives us a tool to repair this problem. Everyone knows by now that our national debt stands at $16 trillion. There’s even a national debt clock that shows this every time some political hack wants to make an issue. But what does this number mean – that so far we have spent $16 T more than we collected in taxes at the federal level. To understand the debt and the annual deficit we must understand a key aspect of how the government does its accounting. The government does its books on a Cash Basis i. e., all the federal accounting, budgeting and assessments are done based on annual cash inflows and cash outlays, something no 21st (or even late 20th) century financial entity would be allowed to do. Only the government among major economic bodies (Corporations, NGO’s, Partnerships etc) does business and reporting this way and it distorts the picture immeasurably. If we want to have any chance of understanding the public products, services and obligations and the time lag with which their costs and benefits kick in we have to unravel this cost basis accounting and see what’s lurking below. Cost Basis does not recognize accrued costs and obligations. The federal government has many, many future obligations (that we can define and quantify to varying degrees right now) that it does not include in its deficit calculations. Our budget deficits are based solely on what the government pays and receives in taxes every year, not the obligations we accrue. It’s true that in 15 to 20 years this surplus will evaporate and Social Security and Medicare will go “bankrupt” if we do nothing. By “bankrupt” we mean that future obligations will require more taxes or deficit spending – just like we pay for most of the other government right now! But do understand that the current debt of $16 T is not a result of these Entitlements. If we are going to use an accrual standard to measure Entitlements and their impact on our debt then we have to use the same standard to measure other future obligations of the government and the hue and cry must be just as vicious about paying for those or going “bankrupt”. 2. Education and Training Deficit. Part of our chronic unemployment comes from a neglect of the training of our work force. We need an urgent Repurposing of our Labor pool if we are to compete in the 21st century. If we start now the results will still take many years to materialize so we can’t wait. Tom Friedman, Bill Gates and El Arien of Pimco, to name three prominent people have been screaming about this. Estimated Accrued Deficit: ?? Trillions. 3. Insurance Deficit. Our government has a large national insurance function. For example. It insures nuclear plants, banks and savings deposits etc. It insures against natural disasters such as hurricanes, earthquakes etc., against major accidents, such as oil spills or coal mining accidents, against disease outbreaks, security breaches, such as terrorism, against unemployment and destitution. You name it. A whopping percentage of the government function is insurance – we need this public good, it seems for without it there can be no power plants, oil drilling, banking or the safety net. But unlike private sector Insurance companies the government does not have to set aside reserves to pay for its future obligations. When these obligations kick in, as during a severe recession (2008-2010), or a natural disaster, big deficits are generated. Net Insurance Deficit: 3-5 Trillions by some estimates – depends on assumptions about future economic conditions also. OK, I don’t need to name all deficits not explicitly included in the debt of $16 Trillion. This is HORRIBLE, you say. Is there any good news that points the other way? Yes, there is. And this is where some of the solutions may lie. When you account on a Cost Basis you do not distinguish between Expenditures and Capital Investments. Both are treated as an outflow of cash. However, capital investments are not cash merely consumed. They produce future cash flows and other benefits. These future benefits are also not included in a Cash Basis Debt number. So when proper Capital Expenditures are accrued properly the real deficit does not grow as fast as the Cash Basis deficit and the future cash flows produced are unaccounted deficit reducers. Good news, huh? This fact can be used to mitigate our employment problem and reduce the debt at the same time! Say you want to produce 3 million jobs per year (as Romney said he would magically do by cutting marginal tax rates). 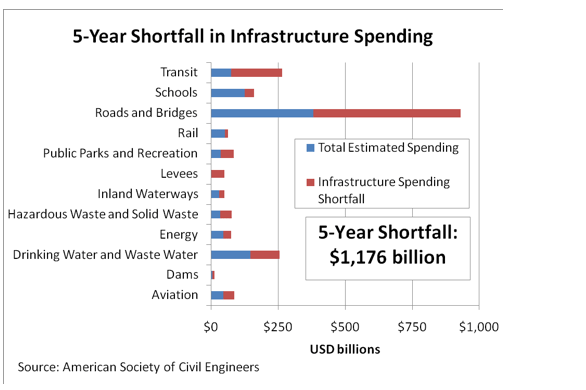 The Government can borrow and spend about $100 billion (per year for as long as it takes – probably one presidential term) rebuilding our infrastructure. Each $billion produces 14,000 direct jobs and about the same number indirect ones. (See my blog here for details). So $100 billion will produce about 3 million jobs. On a cash basis you have just increased the debt by $100 billion/year. But since you have reduced the infrastructure debt by the same $100 billion the net deficit (on a rational accrual basis of accounting) is unchanged. The cost of borrowing: Less than 1%/year for a five year period. Add in gains from: not having to pay unemployment benefits and increases in income tax revenues and this is a hugely beneficial way to reduce the deficit while seeming to increase it. We need this kind of bold analysis to create policies that have a chance to get us out of our mess. The second part of the solution can be from technical innovation, productivity increases and a faster growing economy. During the last century the US grew at a compounded rate of 3% for generations because the US developed every new technology worth inventing – airplane, nuclear tech, integrated circuit, internet, satellites and GPS, biotech … you name it. I saw an interview with Professor Sadoway from MIT working on materials technology (on Steven Colbert’s TV program) who is close to making a battery that can store 100 times the power than today for the same amount of weight. If perfected this technology alone could bring down the price of oil to $20 per barrel (he said) by boosting alternative energy production. As for our Medicare costs and medical costs in general we are projecting to spend $30 Trillion in the next decade as a nation on healthcare. These could come down substantially in the coming years due to converging technologies that will produce zero-cost diagnostics and personalized cost-effective wellness solutions. See my blog on this here. This kind of solution has to be adopted by our nation as a matter of policy. If deficit spending is required to increase the chances of such technologies coming to fruition then let’s do it, despite the howling Republican luddites. (OK, they’re not all Republican and that was a cheap dig). Anyway the point is that the CBO can project burgeoning deficits all they want – they have no way to assess the power of exponentially growing innovation and technologies. If we are unable to continue innovating then, yes indeed, our deficits will be untenable and we will inevitably see a horrible decline in our standard of living. But what if are able to embrace the vision in Peter Diamandis’ book, Abundance, throw the anti-science medievalists out of our leadership and decide as a country to forge ahead on the vision….. the deficits will vanish. This entry was posted in Current Events, Education, Healthcare, Innovation, Investing, Medicine, Money, Politics, Science, Uncategorized. Bookmark the permalink.